Generally grown in North America and Europe, Mulberry fruits ripen in spring and early summer. 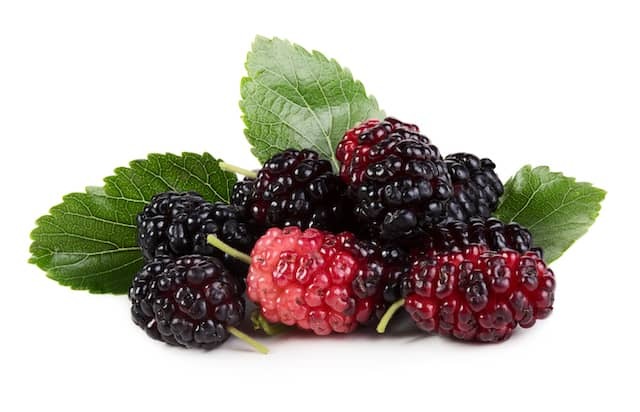 Known for rich antioxidant properties, mulberry fruit helps to promote blemish free, clear skin. Known as the natural substitute to hydroquinone, mulberry extract has amazing skin lightening benefits. It helps in lowering the production of melanin in the skin thus reducing the dark spots and uneven skin tone. The antityrosinase activity of mulberry extract makes it as an effective skin-lightening agent making it an effective natural ingredient in skincare products to reduce blemishes, spots and scars and keep the skin clear and radiant. Mulberries contain anthocyanins that are potent antioxidants that also help in slowing down the ageing process by reducing wrinkles and fine lines and keeping the skin young and rejuvenated.